Triple-negative breast cancer (TNBC) lacks the receptor targets estrogen receptor, progesterone receptor, and human epidermal growth factor receptor 2, and thus, it does not respond to receptor-targeted treatments. TNBC has higher recurrence, metastasis, and mortality rates than other subtypes of breast cancer. Mounting data suggest that the MAPK (also known as RAS-RAF-MEK-ERK) pathway is an important therapeutic target in TNBC. 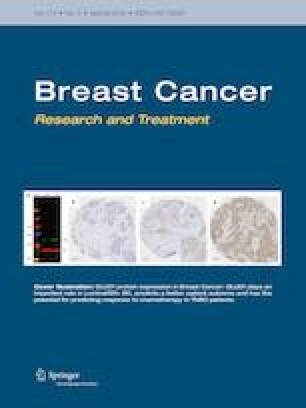 To evaluate anti-tumor and anti-metastasis efficacy of E6201, we used cell proliferation assay, soft agar assay, cell cycle assay, Annexin V staining assay, immunoblotting analysis, immunohistochemistry, migration assay, invasion assay, mammary fat pad xenograft, and experimental and spontaneous metastasis xenograft models. We also evaluated the anti-tumor efficacy of E6201 plus CDK4/6 inhibitor, mTOR inhibitor, or ATR inhibitor. E6201 inhibited TNBC cell colony formation, migration, and invasion in a dose-dependent manner. E6201 induced G1 cell cycle arrest and apoptosis. E6201 inhibited TNBC xenograft growth and inhibited TNBC lung metastasis and improved mouse survival in experimental metastasis and spontaneous metastasis assays. Immunohistochemical staining demonstrated that E6201 decreased the metastatic burden in the lung and decreased phosphorylated ERK expression in a dose-dependent manner. Combination of E6201 with CDK4/6 inhibitor or mTOR inhibitor enhanced E6201’s in vitro anti-tumor efficacy. These results indicate that E6201 exhibits anti-tumor efficacy against TNBC in vitro and anti-metastasis efficacy against TNBC in vivo. These results provide a rationale for further clinical development of E6201 as a MAPK-pathway-targeted therapy for TNBC. The online version of this article ( https://doi.org/10.1007/s10549-019-05166-3) contains supplementary material, which is available to authorized users. A correction to this article is available online at https://doi.org/10.1007/s10549-019-05218-8. We thank Sunita Patterson and Stephanie Deming of the Department of Scientific Publications at MD Anderson Cancer Center for editing the manuscript. This work was supported by the Morgan Welch Inflammatory Breast Cancer Research Program, the State of Texas Rare and Aggressive Breast Cancer Research Program, the National Institutes of Health/National Cancer Institute (Grant CA123318), MD Anderson’s Cancer Center Support Grant (P30CA016672, used the Characterized Cell Line Core Facility and Flow Cytometry and Cellular Imaging Facility), and Spirita Oncology, LLC. Naoto T. Ueno has a research agreement with Spirita Oncology, LLC. Linda J. Paradiso and Thomas Myers are employees of Spirita Oncology, LLC. All other authors declare no potential conflicts of interest. Animal studies and procedures were approved by The University of Texas MD Anderson Cancer Center Animal Care and Use Committee. Protocol #: 00000968-RN02 (approval date 5/1/2015, expiration date 4/22/2021).